Many people have asked me what I like to do here in London, what are some of the best things to do/see in London or what are some “off the map” kind of things to do/see? So I’ve painstakingly compiled a couple of “Top 10 lists” for those of you who have asked or are interested in coming to London. I’ll be posting them one by one over the next few days. Let me know what you think! 10. The Underground/Buses: Love it or hate it, London’s transport is definitely something you have to experience–and chances are, you will anyhow. Why not take some time to have a poke around appreciate the Underground? Or ride up top a double decker instead, and see some of the “off the beaten path” stores and places you might not have read about in your handy guide book? 9. 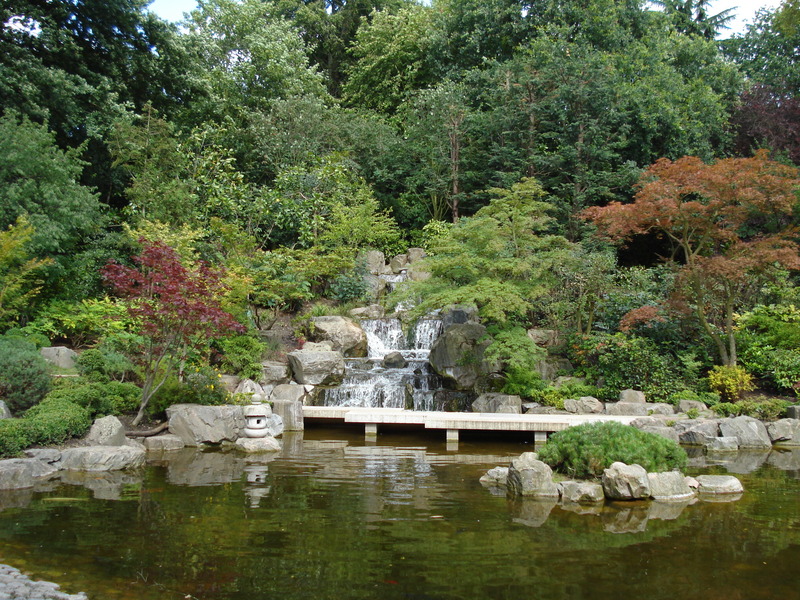 Parks: Holland Park (pictured) is my favorite. Most of the parks and commons in London are fantastic. Take an afternoon out and go for a stroll, picnic, or lounge on the grass! 8. Markets: Markets are way cool and you can always find stuff fairly cheap. 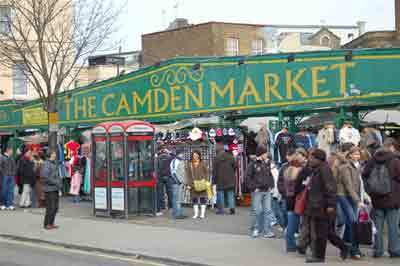 Camden Market is really interesting and funky–and there’s loads of punk/goth kids running around. The market’s food area is spectacular. Loads of food from different countries. I had Caribbean food there for the first time. 7. 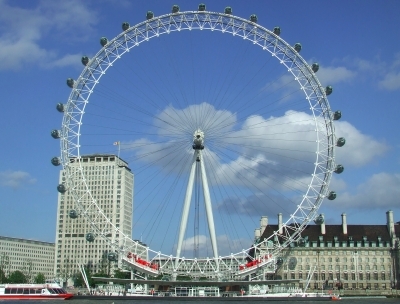 The London Eye: You can see the whole city from above. One rotation takes half an hour, it’s expensive, and you inevitably have to wait in line. But it’s sooooo worth it. 6. Pubs: There’s really not much more to say. 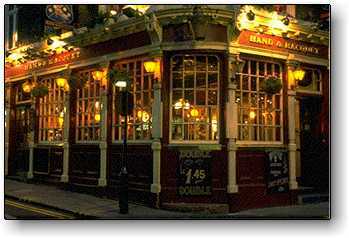 If you come to England, you have to go to a pub. They’re just really fun and really “local.” Try the cider–Magners in particular. Deslish! Obviously, it looks a bit obscene–but it’s also a really impressive structure! And it’s absolutely massive. The Brits are pretty divided on how they feel about it. You either love it or hate it, really. And then there’s the Lloyds Building, which is so ugly that it’s interesting! And there it is, right in front of the Gherkin. It’s just really industrial factory looking, don’t you think? 4. Shopping at Harrods: Or, if you’re really poor like me, “browsing at Harrods”. Harrod’s is all about the name, really. It evokes a sense of “poshness” and a well-to-do lifestyle. You’ll never fail to impress guests if you serve tea from Harrods (despite the fact that I prefer the cheap Twinings brand myself). But really… Harrods is worth a wander. There are more tourists than locals there, but you can spot a celeb or two from time to time. There’s so much you had no idea you needed at Harrods… like a diamond studded jacket for your pooch! There’s also a candlelit memorial to Princess Di and Dodi in the lower level of the building, as Dodi’s dad owns Harrods (and that’s probably why the royal family crest no longer denotes the store as a preferred royal shop!). 3. 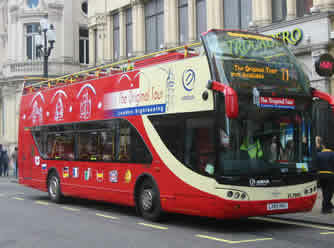 Sightseeing buses: Yes, they’re expensive. Yes, they’re full of camera snapping tourists. But they’re really cool. And worth the money and the hassle. If you go with a reputable company, you’ll learn stuff about the city that lots of locals might not even know! 2. 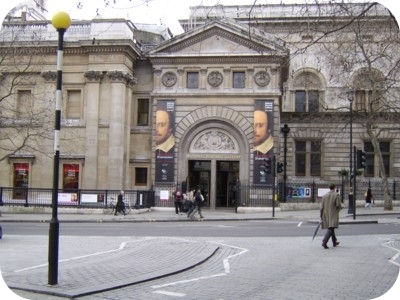 Museums: You HAVE to go to museums in London. Not only because they’re free at the moment (until 2011, I think), but because they’re just so damn interesting! The Natural History Museum is really cool–dino bones and archaeological stuff and all. The V & A is alright, and the Portrait Gallery is one of my favorite places in London, despite only having been there once. And if you’re into modern art (I’m not, but the museum is cool), definitely see the Tate Modern. You’ll see everything you came to London to see: Parliament, Big Ben, St. Paul’s Cathedral… You can’t go wrong. 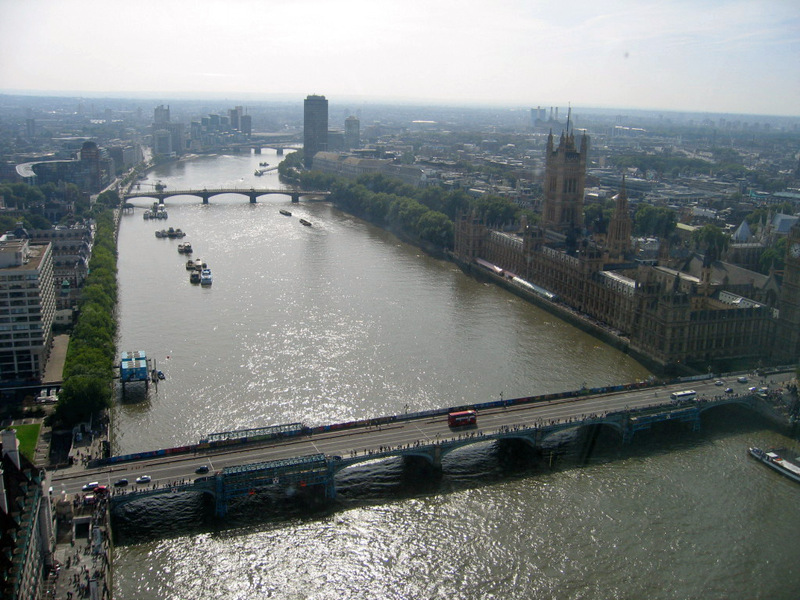 If you’ve got the endurance, start from Westminster area and walk all the way to Tower Hill. It’s probably a mile or two, but it’s positively amazing.